"Wedding Eve" & "Landing Gear"
If you learn one thing about me quickly, you’ll learn that I’m a really emotional person. I can’t help it. Ever since I was a child, I have always been extremely sensitive. My mom likes to tell the story of how during my first birthday, the family tried to get me to smash my hands or face into the birthday cake. I refused, and then got a little icing on my finger and cried. My cousin (less than a year older than I was) then proceeded to try and smash her hands into my cake. I process emotions mostly through crying. I don’t get angry very often, to be honest. I mostly just cry — whether happy, frustrated, angry, or extremely sad. So it stands to reason that I cry a lot at weddings, whether fictional or real. During my friend Kate’s wedding, I cried much more than I expected to. I began to cry during the first dance at my friend Heather’s wedding as I held both her bouquet and mine in my hands. I cried when Leslie Knope and Ben Wyatt got married on Parks and Recreation, and I cried when Chandler and Monica got married on Friends. I’m a sucker for weddings because they represent everything good within two people, and a wedding is the celebration of the combination of that goodness. Because New Girl brought everything to its forefront this season — humor, earned emotional stakes, character growth and development, and so much more. And that is what has solidified it as my favorite show on television. 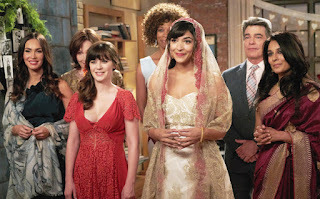 Before I talk about the Nick/Jess of it all, let me first talk about the structure of “Wedding Eve.” I absolutely loved this episode and its pacing. Written by two of my absolute favorite New Girl writers — Nina Pedrad and Kim Rosenstock — this penultimate episode is one that separated the men and the women for a few acts, then brought them back together for an epic game of True American. It’s funny to me that this drinking game in all of its absurdity (no one apart from the loft crew understands the rules, which is like, the perfect metaphor for the loft in general) is the one thing in this show that consistently brings about either really illuminating or really heartbreaking character growth. And “Wedding Eve” had some very subtle but very meaningful callbacks to “Cooler” in this regard (with Sam and Jess behind the Iron Curtain as one example). A lot of season five seemed to harken back to season two in the best way possible. Where season four managed to reestablish why these people were friends, season five established the lengths that they were willing to go to in order to secure one another’s happiness. Everyone in this show has grown leaps and bounds since the pilot episode and honestly, that is what consistently impresses me about New Girl and why season five can be counted among the series’ best. But back to the plot of the episode for a moment: it’s the night before Schmidt and Cece’s big day, and the men and women are separated in order to get rest and prepare for the morning’s festivities. Jess and Cece share her room together, with the former insisting that she is there for Cece, no matter what she needs. Jess gives her best friend some pretty wonderful advice and gifts, telling her that she can only pull the “bride card” once in her life, and to make use of it. Cece, however, is calm. She really is. She’s excited to marry Schmidt and she doesn’t want to run from it. She wants to run toward him and spend the rest of her life with him. Across the hall, Schmidt is calm too... until he realizes something. The flash drive that had his wedding vows on it is missing. This prompts Winston to recall stepping on the flash drive earlier in the night. Much like Leslie Knope, Schmidt prepared his lengthy vows and doesn’t remember any of them. Ever the best man, Nick agrees to help Schmidt rewrite them that evening. Unfortunately, they’re about to be deterred by a game of True American. In Jess’ room, she discusses how happy she is with Sam and then accidentally discovers an engagement ring in his jacket pocket. Cue Jess’ panic, as she begins to think about spending her life with Sam. In typical Jess fashion, she doesn’t just panic — she diverts all of the attention away from her and calls for an impromptu game of True American to distract from the fact that Sam wants to talk to her. Zooey Deschanel’s reaction to that line is absolutely beautiful. Jess’ face is a mix of disbelief, confusion, and overwhelmed emotion. Every character in this show, I think, roots for Nick and Jess to be back together (Cece knows that Nick and Jess are meant to be together — a fact she basically states in “Landing Gear”). Nick and Jess have been apart now for a few years. And Liz Meriwether constantly states that these two are the heart of the show. The thing I admire about her is that she admits the staff didn’t really know how to integrate Nick and Jess well into stories in season three. That’s part of the reason the season faltered, really — the decision to isolate Nick/Jess stories removed part of the reason the show was so successful in the first place. But Nick and Jess have always been at the heart of this show. They’re the emotional core, even if other pairings (see: Schmidt/Cece) have found a place in the core too. The show’s DNA will always be about the relationship between all of these people — Winston, Nick, Schmidt, Jess, and Cece — but what drives the show, from an emotional standpoint, is often the romantic relationships between couples. Nick and Jess have this chemistry and magnetism that cannot be manufactured. Jake Johnson and Zooey Deschanel have had this on-screen pull since the very beginning of the show. And the New Girl writers did a great job of developing that chemistry without making the relationship seem forced or ingenuine. The show has slowly been building back toward a reconciliation between Nick and Jess this season, in the best way possible. You see, when Nick and Jess broke up, they did so because they thought their differences were so vast and so great that nothing — not even love — could overcome them. Jess wanted plans and commitments and Nick wanted spontaneity and a little silliness. But now, Nick has grown up. He’s become a better version of himself: more responsible, more dependable, more driven, and sure of who he is and what he wants. Nick has crossed emotional hurdles in his relationship with Reagan this year and it has made him a better person. But that better person has moved on from Jess and now, she is forced to sit idly by and watch him happy with Reagan. Because she loves him. She’s always loved him, and I am ecstatic to see Jess pained and pining because it’s such a full-circle development in the Nick/Jess romance. We’ve spent so much of New Girl fixating on all the things Nick would do for Jess. He would drop everything if she called. He’s come running to her before — all the way back in the pilot, remember? — to rescue her or comfort her. Nick Miller loves her with everything he has and he’s not afraid to show it. And now it’s Jess’ turn to reciprocate. A lot of the problems people have had with Nick/Jess have centered on that imbalance and the idea that Nick is always the one doing things for Jess, while Jess hasn’t done much in return. “Wedding Eve” and “Landing Gear” saw the beginning of what I expect to be that reversal. With season six on the horizon (and what could be the show’s final season), it seems highly plausible that these two are going to be endgame. Schmidt’s mom and her partner Susan get engaged at the end of “Wedding Ever.” As it turns out, the ring that Jess found was never Sam’s ring to begin with. Louise and Susan are happy, and Schmidt is elated that he’ll have two moms at his wedding. When Cece disappears into her room, Schmidt comes to find her and walks in on her crying. She’s so happy for him, but Louise and Susan’s presences just remind her that he will have two moms at their wedding and she’ll have none. It’s then that Schmidt vows (pun intended) to fly to Portland and bring her mom to the wedding. Shenanigans, of course, ensue when Nick wakes up to find Schmidt missing and enlists Jess’ help in crafting a lie, since he’s horrible at lying. The pair try to keep Cece calm, but a call from Schmidt about the plane being delayed, possibly for hours, on the tarmac incites panic in the pairing... and Cece, once she realizes where Schmidt actually is. Meanwhile, at the wedding site, Coach and May watch as Winston (who confessed his love for Aly in “Wedding Eve” and it was BEAUTIFUL) tries to be the perfect best man/“bridesman” and refuses to do any pranks. Back at the loft, the gang scrambles to figure out a way to stall the wedding since Schmidt is stuck without a way to get off the plane, when Cece’s mom shows up and surprises everyone. She came to the wedding because of the fact that every week, Schmidt left her a voicemail message about how much he loved Cece and would do anything for her. There were messages about their wedding day, their future family, and even one about the bachelor party fight in the desert (which was so perfect). Cece’s mom was so touched by Schmidt’s character that she agreed to come to the wedding. Unfortunately, Schmidt is still stuck on the plane with no real way of escaping. As the gang stalls the wedding, they realize quickly that there’s no way they can stall long enough for Schmidt to return. So Schmidt — in a moment of absolutely beautiful self-sacrifice — tells Cece to have the party without him. They can get officially married at city hall, anyway. He doesn’t want her to miss out on her big day, and he decides he can participate remotely in all the shenanigans via video chat. In a hilarious montage, the passengers on the plane conga line with Schmidt, listen in on the toasts, and watch as Cece feeds cake to her tablet. At the wedding party, Nick confronts Reagan (who came! as his date!) about starting a relationship. This is a big deal for Nick, and Reagan expresses no desire to have a relationship with him. Obviously, Nick’s spirit is crushed and Jess is tasked with talking up Reagan and figuring out what is holding her back. This episode is so important for Jess in terms of character development, because as she tells Reagan about the reasons she and Nick broke up in the first place, Reagan notes that they’re valid reasons. It’s only then, at the table watching Nick across the room, that Jess realizes they weren’t valid reasons at all. Not anymore. They seem silly to her and trite, and she watches as Reagan crosses the room to dance with Nick. Jess watches him happy, and it absolutely breaks her heart. New Girl doesn’t need to use any words to convey how pained Jess is in that moment, because Zooey Deschanel does a fabulous job of conveying that without any words at all. Even when Cece approaches and puts her arm on Jess’, the women don’t explicitly state what is wrong. But they know. And in that moment, there was never a better depiction of true friendship. Eventually, the party ends as all parties do. Schmidt’s flight to Portland takes off, much to his frustration, and by the time he returns to Los Angeles and the loft, he’s absolutely exhausted. He steps off the elevator though only to see Nick, Coach, and Winston greet him with mouthwash, refreshing face spray (courtesy of Winston’s job), and everything else he needs to feel rejuvinated. It’s the middle of the night, but Schmidt looks down and sees the flower petals leading toward apartment 4D. And he just knows. He has to marry Cece. He can’t wait a moment longer. And so the two get married, in a way that reminded me a lot of Parks and Recreation’s “Leslie and Ben,” because the loft crew had created the entire wedding set-up for Schmidt, down to May playing the cello for their entrance. The pair exchanged vows in a moment that was humorous (Cece vowing to spend a lifetime with him as he mispronounces common words) without undercutting the sentiment of the moment. I loved the integration of both Jewish and Indian customs, and thought it was all extremely beautiful. But here’s the moment that got me and it got me good: the ceremony is almost over, until the rabbi realizes that the pair doesn’t have a glass to break. Ever the quick-thinker, Nick hands Schmidt the douchebag jar. And it was such an absolutely brilliant and beautiful moment, because Schmidt literally destroyed the thing that made him unbearable to everyone else — the thing he had to put money in when he claimed he would marry Cece in the pilot. And with Schmidt smashing the glass, it is a visual representation of his character growth, and how much he has developed since the pilot. It was one of the most silly and yet profound things that the show could have done in this wedding. And then, Schmidt and Cece are married and showered in beautiful petals. Jess is still in pain — you can see it on her face — and when I paused long enough to think about it, I realized why: suddenly, everyone is happy except for Jess. Nick is with Reagan. Schmidt and Cece are married. Winston and Aly are in love. Coach is happy with May in New York. And Jess is, for the very first time in a very long time, alone in the loft. She desperately wants to feel the thing that Cece couldn’t put into words — the moment you know that you’re meant to be with someone forever. Cece described it in such a beautiful way, telling Jess that it feels like home. But Jess has only ever felt that way with one person, and she’s now acutely aware of that fact. She knows what she lost and why she lost it. And now she’s afraid she’ll never get it back. Later on, we come to the final Nick/Jess conversation of the season. Nick tells Jess that he’s going to New Orleans for three months with Reagan for her job. He’s elated to be with her, but so immensely insecure. He wonders aloud why someone like her would choose him, and then rattles off to Jess the idea that he’s the pit stop in finding true love for everyone. He’s not the husband — he’s the guy you date before you get to your husband. She literally snaps, and yells at Nick, grabbing at his suit jacket. Jess tells him that he needs to stop doubting himself, and that she’s tired of being the only one who sees how amazing he is. There’s this amazing and powerful beat of tension after she does this in which I genuinely thought that the two would kiss. I’m glad they didn’t, because I think Jess needs to find her way back to Nick with more things like this, and Nick needs to be happy apart from Jess for a while. Still, there was this little electric moment where Jess was able to say the thing she wanted to — not everything she wanted to, but something. It’s not an ending, but a beginning that (I believe) will catapult Nick and Jess back toward reconciliation in season six. I love New Girl with every fiber of my being, and I am overwhelmed — if you couldn’t tell, check the word count of this review. SHEESH! — with all that the show managed to do in its final two episodes this season. This show continues to be full of humor, heart, and character development. And I literally could not be more thrilled. This week, Erik Adams wrote his last New Girl review for The AV Club. He’ll still, as he says, be watching the show but he’s passing on the reviewing torch to someone else. I just want to express how much I admire Erik Adams as a writer and loved his New Girl reviews. They’re literally the only ones apart from my own that I read, and he’s always been fair and provided good criticism for the show over the years. In a world where critics are slowly becoming more and more bitter, it’s refreshing that Erik has generally stuck to being pleasant and even-tempered in his reviews. I’ll miss reading them but am glad he’ll still be watching with us all next season. I’m not ready for this season of New Girl to end, and yet here we are. “Mayday, J-Day!” WHY HAS THIS NEVER BEEN SAID UNTIL NOW? I didn’t get a chance to dive into it deeply above, but Winston and Aly said “I love you” to one another for the first time in “Wedding Eve” and it was absolutely beautiful. Nick says there are seven types of stories in the world: “Man versus man, man versus dog, dog versus zombie, James Bond, stories of kings and lords, women over 50 finding themselves after divorce, and car commercial.” If you want to know the actual seven kinds of stories (though I think I prefer Nick’s) here they are. Nick’s zombie novel is called “Uh-Oh, Guts” and honestly this is perfect. The fact that they played True American: First Ladies Edition is the absolute best. Coach and Cece missed each other. Remember when they briefly dated in season three? There were flashbacks to “Elaine’s Big Day”! I don’t know why, but the fact that Winston texts Reagan every day is just so amazing and in-character to me. Additionally, can we all agree that Winston Bishop is the true MVP of this season? FURGUSON IS IN THE ELEVATOR. “I SWEAR TO GOD, I WILL SCREAM-SING EVERY WORD TO LES MIS.” I want to see this. I want like, a five-minute clip of JUST THIS. I cannot overemphasize how perfect the wedding was. And these two episodes. I haven't been as enthusiastic about Season 5 as I have previous seasons (that has more to do with me than the quality of the show ... though it partly has to do with the quality of the show), but I loved the finale so much that I feel compelled to read a lot more reviews than I usually do. "Landing Gear" now finds itself among my top 3 New Girl episodes of all time, right alongside "Cooler" and "Background Check." What's one thing those 3 have in common? You guessed it: a particularly nervous Nick Miller. Ooooohhh, this review was such a delight for me to read - I'm Sweden's biggest New Girl fan by far, and SO addicted to this show!! I agree with everything you write, and although being a true Ness shipper from the very start (and thus not very objective), I must say I was extremely impressed with Zooey Deschanel's performance in these two final episodes. The feelings she managed to convey only with her eyes...it made me shiver and gave me goosebumps all over! I just really really hope they won't start season 6 in January - I mean they've always had the premiere in September with the exeption for last year and that was due to Zooey's pregnancy. So the likelihood this year would be September, right? Like you, I always cry at stuff like this, and there I was in happy tears over the wedding - and then when Jess snapped at Nick I absolutely broke down. I realised it was because when he started in on his little speech about not being a good guy that I was used to it, and I was waiting for Jess to make a joke or something. It wasn't until she snapped at him that I realised out of all the times Nick puts himself down nobody has ever corrected him. Most of the time they agree with him, and that just ain't right. I was so shocked when she shouted, and so was Nick. It was just such a well done moment and I loved it.